Paris, Ensba, Masson 811 (formerly 717). Pen and ink and wash, 27.9 x 37.4. Compared to the print (E.102) that was made from this drawing, it could be cut at the left by 2-2.5 cm. and slightly at the top. PROVENANCE: Jean Masson (Lugt, Supplément, 149a). Masson, 1927, 30, no. 171, as Boyvin after Rosso. Kusenberg, 1931, 150, no. 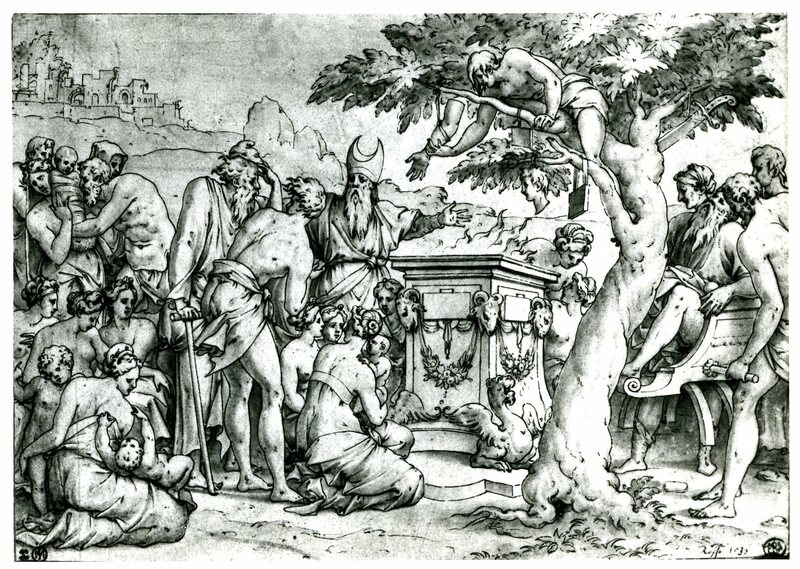 28, as by Boyvin for the reversed print by him [actually by Milan], and as after the small fresco under the Scene of Sacrifice in the Gallery of Francis I.
Zerner, 1969, under P.M. 1, as probably Milan’s drawing for his print. Béguin and Pressouyre, 1972, 139. Carroll, 1987, 43, 44, 282, 284, n. 2, under no. 89, as a copy of a lost drawing by Rosso done by Milan or an assistant of the printmaker to serve as the model for Milan’s engraving. Brugerolles and Guillet, 1994, 130-133, 131, Fig., no. 42, as by Pierre Milan after a drawing by Rosso of 1532-1534 [and wrongly as in reverse], and gone over with a stylus for transfer to the engraver’s plate. Acton, in French Renaissance, 1994, 296, under no. 70, as copied from Rosso’s drawing and the copy used by the printmaker. Béguin, 1995, 193, as a copy [again wrongly as in reverse] of a lost original by Rosso, and questions the attribution to Milan, stating that a drawing for a print need not be by the printmaker himself. This drawing served as the model for Pierre Milan’s reversed engraving of 1545 that is inscribed with Rosso’s name (Fig.E.102). 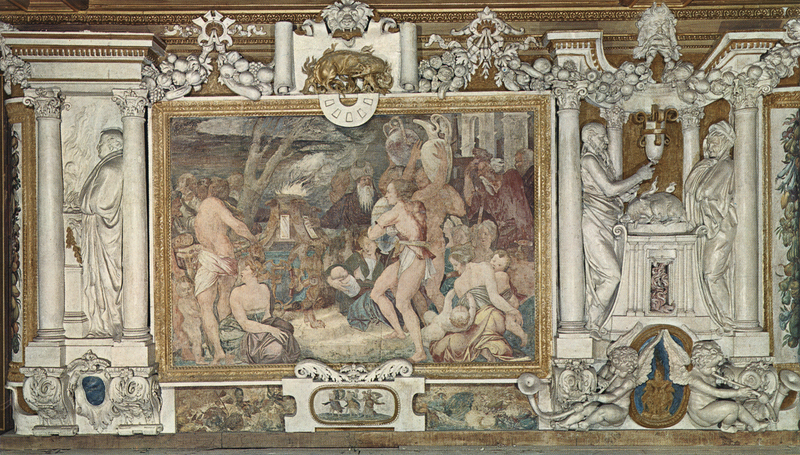 The drawing shows the scene in the same direction as the small fresco to which it is related under the Scene of Sacrifice in the Gallery of Francis I (Fig.P.22, VII N a). 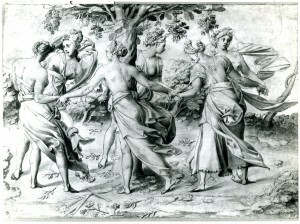 But the painting does not show the tree around which the dryads dance in the drawing, a tree that, according to the Panofskys, refers to Ovid’s story of Erysichthon, who scorned the gods and cut down the mighty oak that stood in Ceres’ grove.1 The removal of the tree from the small frescoed scene seems to have taken place when the large Scene of Sacrifice was re-interpreted after the death of the Dauphin on 10 August 1536. 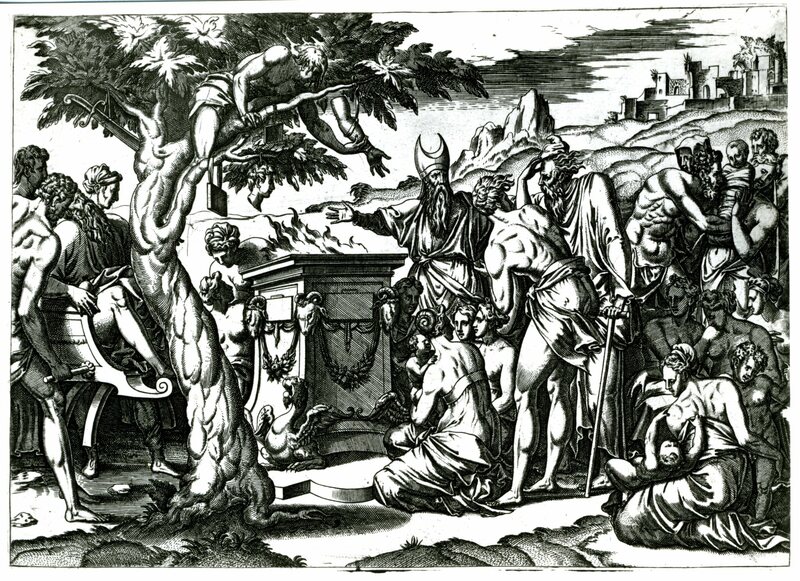 The first version of the Sacrifice (Fig.D.51; Fig.E.50) showed a large, old, and gnarled tree prominently placed in the foreground, equal in importance to the altar beneath it and perhaps more important even than that altar. It could be that it was thought redundant to include a large tree in both scenes. But the original iconographical significance of the tree as symbolic of “France and her dynasty,” according to the Panofskys, and perhaps also of Francis I’s royal line, would seem to present two aspects of this symbolism in the large and small frescoes, one sacred, the other celebratory. The Panofskys suggested that the tree in the Dance of the Dryads indicates “woe to the new Erysichthon, real or suspected, who might dare lift his axe against the sacred oak.” However, with the death of the Dauphin, the tree in the large fresco was given less prominence behind the altar and it was not hung with ex-votos. Hence in the Dance of the Dryads the removal also of too emphatic a reference to Ceres’s sacred oak that was so willfully destroyed by Erysichthon. 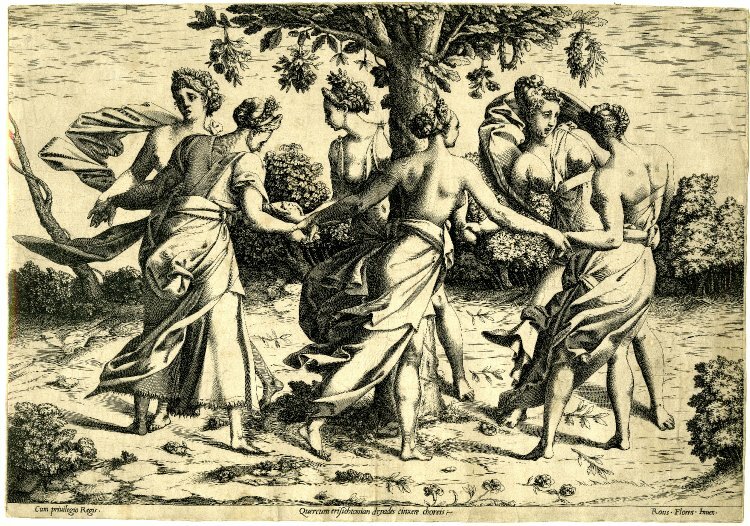 Thus, the Dance of the Dryads would have been invented to accompany the first version of the Scene of Sacrifice and dates from the first period of work on the decorations of the Gallery of Francis I between c.1531/1532 and 1534 (see P.22). The Ensba drawing could not have been made by Rosso himself, as its draughtsmanship bears no relation to any of his kinds of drawing, but all aspects of the scene show his invention, which is acknowledged by the inscription on the engraving. The draughtsman would seem to have made an accurate copy of Rosso’s composition in a graphic style that, it would seem, better served the needs of the engraver. As Zerner suggested, it is probable that the draughtsman and the engraver are the same, unless, it might be added, Milan employed an assistant to prepare his models. It is not possible to know in what medium or media Rosso’s original drawing was executed. 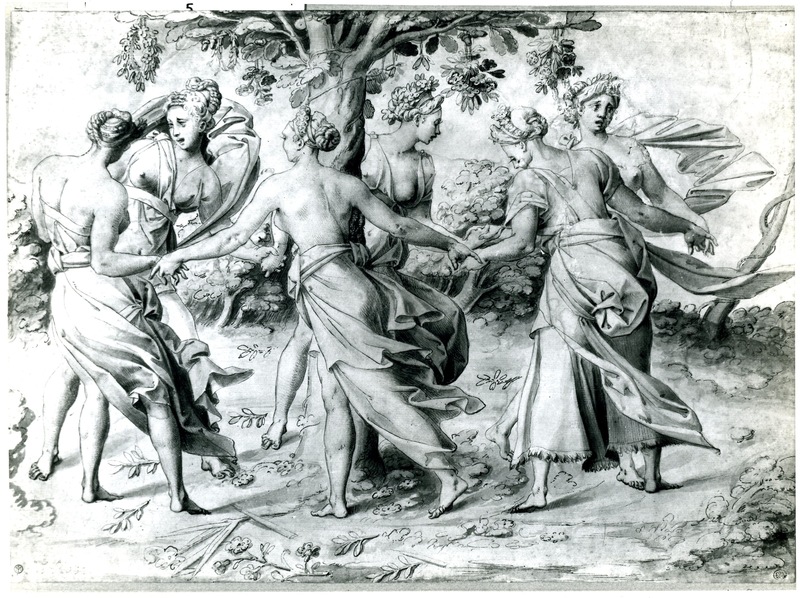 As all the other drawings made for the Gallery of Francis I seem to have been executed in pen and ink and wash, perhaps with white highlights and on paper prepared with a dark ground, the Dance of the Dryads may have been also. Such a drawing could have been considered too varied in its lights and darks to serve as the model for an engraving. PRINT: Pierre Milan, E.102 (Fig.E.102). Engraving, in reverse, for which D.52 was made to serve as the engraver’s model. 1 Panofsky, 1958, 120-126. The small painting in the gallery is not the original fresco but it must preserve its appearance without a tree. Otherwise one might suppose that the restorer of the scene, not able to work from what survived of the original painting, would have referred to Milan’s print and painted the scene with a tree.